Dies R Us: Tea or Coffee???? Well, I happen to be both! Coffee in the A.M. and Tea in the P.M. I've recently been commissioned to make some cards/projects for a local 'tea shoppe' and I LOVE that I can go to the Dies R Us Store and find a variety of 'Tea Related' dies to create with. Isn't this Taylored Expressions Eventful Tea Party Die (TE605) set adorable?? WOW! These dies go in and out of the store SO FAST! Every time I think I'll share something really cool .... everyone else thought it was cool too and bought them out!! LOL! 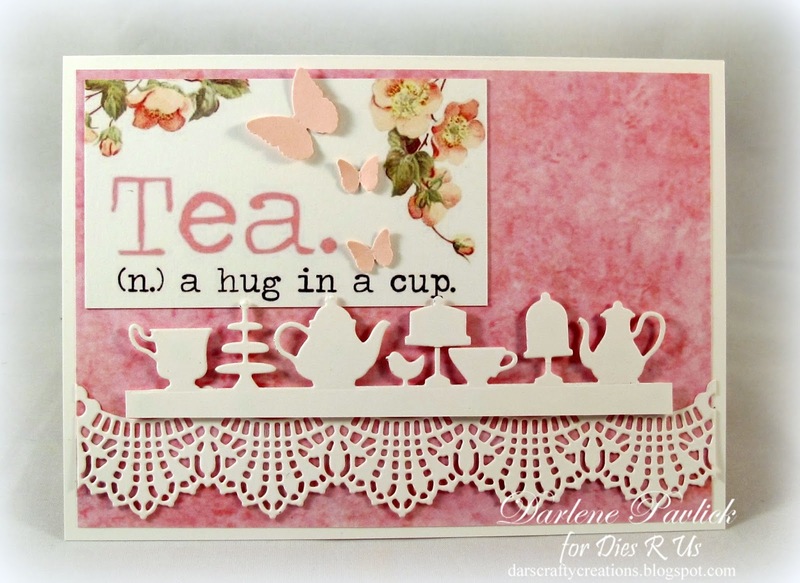 YEP ... this die is OUT OF STOCK but check out this Trimcraft First Edition Tea Party die set ... how cut is that!!! Guess I'll be adding it to my next order before it disappears too! LOL! Now, how about this card creation ... talk about QUICK & EASY!! 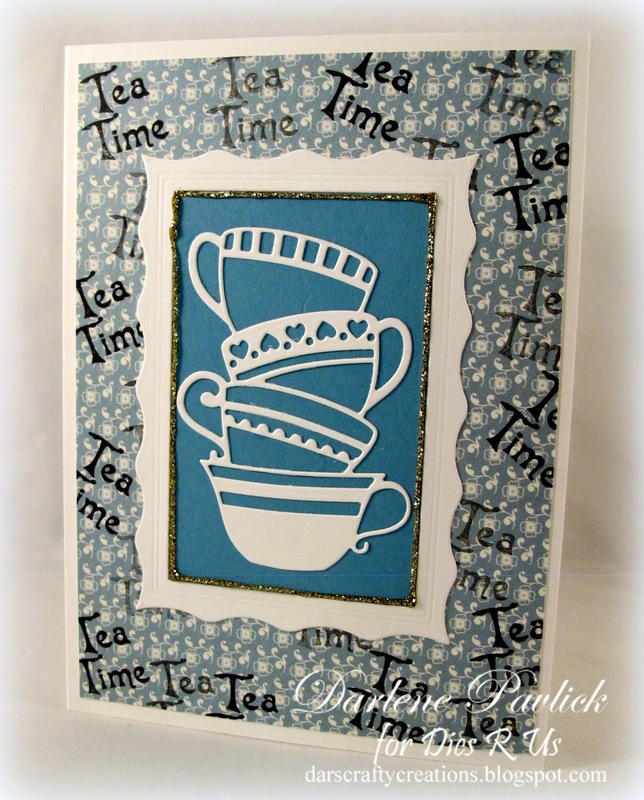 I've used a piece of design background paper from a 6x6 Graphic45 pack ... stamped 'Tea Time' all over it then added my Poppystamps 'Tea Cup Stack' (POPPY-1086) panel. 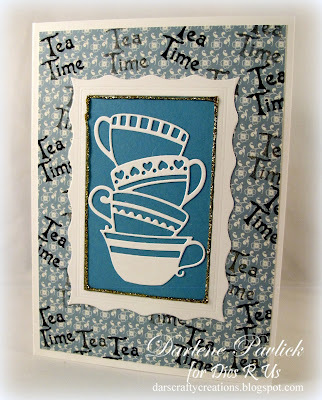 I've created my tea cup stack panel but first die cutting the teacups from white card stock. Adhered them to a scrap piece of medium blue card stock THEN I die cut a frame using the Impression Obsession Rectangle 6-in-1 Frame (DIE242). Since I already had my tea cup panel cut and laying on the table to be turned into a card, I actually got lucky that THIS particular frame panel fit ... well, ALMOST fit! It wasn't quite perfect, so I created a border with gold Stickles and VIOLA! Well, there you have it! Remember, if there is a particular 'themed' die you're needing to work with, simply go to the SEARCH box at the store and type it in. You'll be AMAZED how many awesome dies will pop up in front of you ... I'm sure you'll find exactly what you'll need!! Hope you have a fabulous weekend ahead! REMINDER: You still have plenty of time to join in the current challenge at our Dies R Us Challenge Blog. Our theme this time around is BACK TO SCHOOL. We'd love to have you come join us! !